In our opinion there's no 'best' time to safari - if you're not going with any preconceived ideas and impressions you can't be disappointed and anyway every safari is different! That said, there are times when safariing can be miserable i.e. during the rains when it can be difficult to travel, and then there are other times when spectacular events such as the migration occurs - and you don't want to miss that for the sake of moving your itinerary a couple of weeks! The migration tends to follow the rains, as the wildebeest, zebra and gazelle search for new grass. In our experience the rainy seasons can only be used as a rough guide, as the pattern has often changed in the years we have been travelling to East Africa. Even on our first safari in mid-late Dec. 1994 our itinerary had to change as the rains made the Chyulu Hills impassable and the Mombasa-Nairobi railway had been washed away just before we arrived. On another trip we sneaked in a safari to Sobo Camp (Tsavo East) over Christmas in a two week window of good weather. Either side the Galana River flooded, completely washing away the camp early in January. In other years the rains have failed completely. 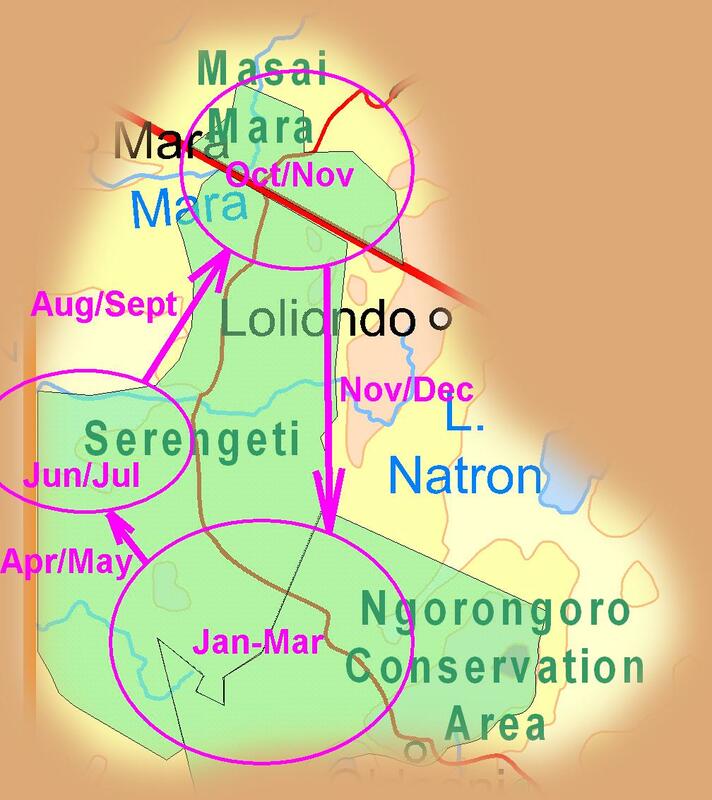 The Western Corridor in the Serengeti has its own sub-climate due to its proximity to Lake Victoria. Water is evaporated from the lake during the day and deposited on the land in the afternoon and evening - often in violent thunder-storms. The water circulates back to the lake via the rivers and streams.